Strawberry Point, Iowa, is located about an hour west of Dubuque and an hour north of Cedar Rapids. 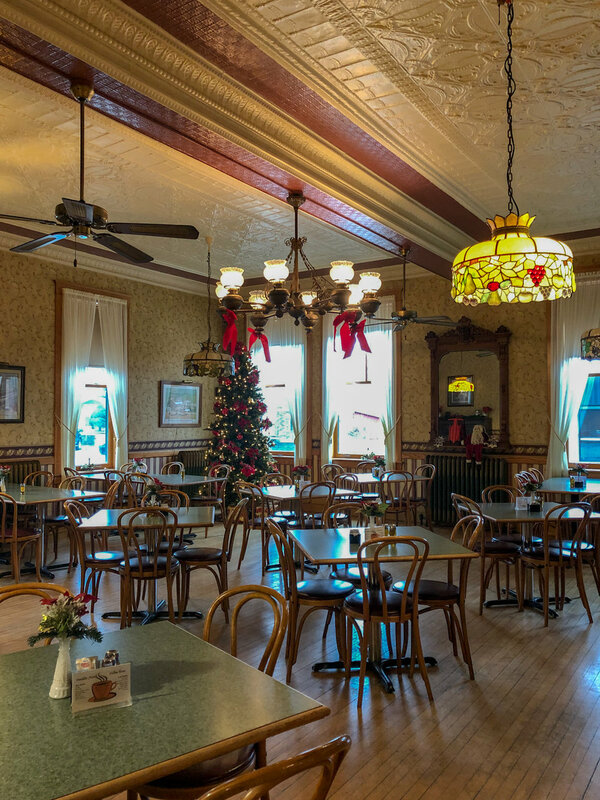 It has a population of under 2,000, but it is home to the Franklin Hotel, listed on the National Register of Historic Places, the Wilder Museum, home to an heirloom collection of over 800 dolls dating from the 1700s, Iowa’s oldest state park and the world’s largest strawberry. 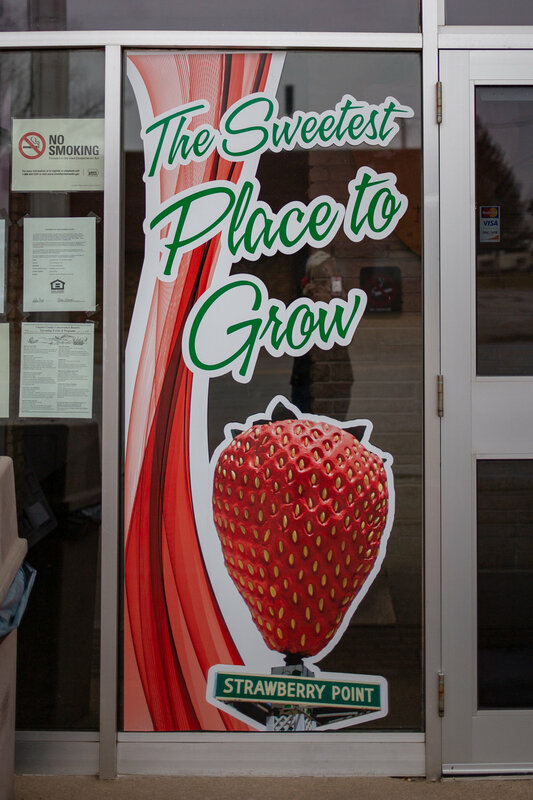 The town of Strawberry Point was founded in 1853 and named for the wild strawberries found in the area. The Franklin Hotel was built in 1902 and we had coffee in the hotel restaurant, which is unsurprisingly decorated with a strawberry motif—I love a town that really leans into a theme (like Roswell or Sleepy Hollow). 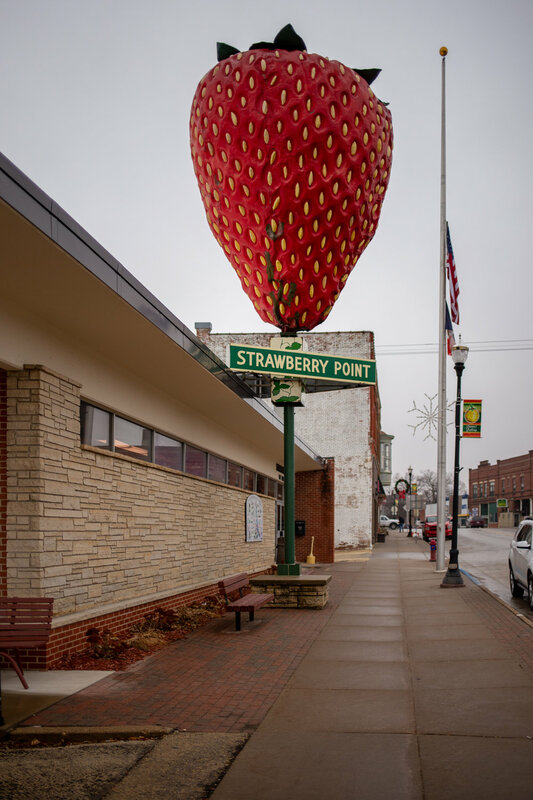 Strawberry Point is the very definition of a one-stoplight town and I love exploring small towns in the middle of America just as much as—and sometimes even more than—I like visiting more popular tourist destinations. The Wilder Museum was closed for the season, we were the only people in the hotel restaurant aside from our waitress, and the ‘bakery’ we saw advertised was just a table in the grocery store manned by a handless mannequin. The 15-foot-tall, painted fiberglass sculpture was designed by a local ad agency, and it has been on display in front of the City Hall and police station since the 1960s. It’s incredibly detailed, much larger than I expected and appears to be well cared for (although it could use a little touch up at the bottom). This big roadside attraction is comparable to the world’s largest pistachio—neither are real examples of the food, which is an entirely different (and probably highly competitive) area of distinction. ‘World’s Largest’ designations are sometimes dubious at best—you might remember that I’ve already visited what claims to be the world’s largest strawberry, located in Ellerbe, North Carolina. While they do have the url worldslargeststrawberry.com, the Berry Patch farm stand could more accurately be called the world’s largest strawberry-shaped structure, while Strawberry Point’s version—unfortunately saddled with strawberrypt.com—could be more specifically described as the world’s largest sculptural strawberry.